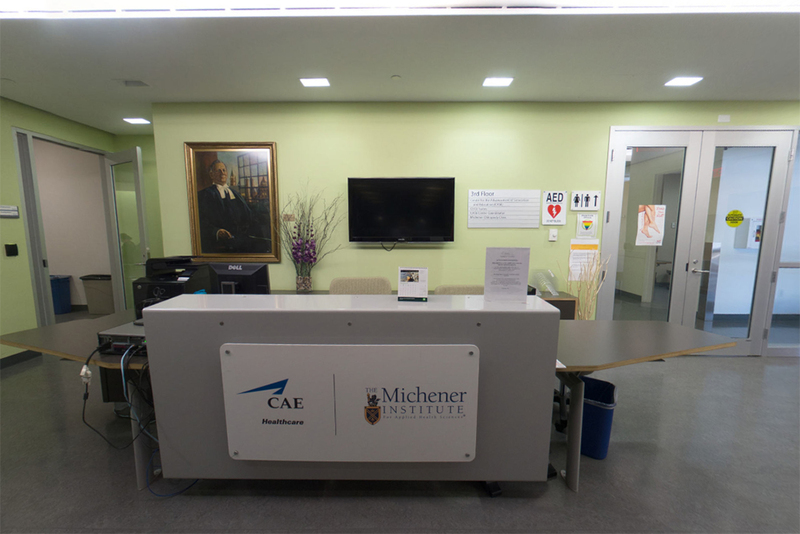 Located within the Michener Institute of Education at UHN, St. Patrick Campus, CASE is one of the largest simulation-based learning centres in Canada and serves our larger community as an innovative space where interprofessional, simulation-based learning and evaluation can occur. 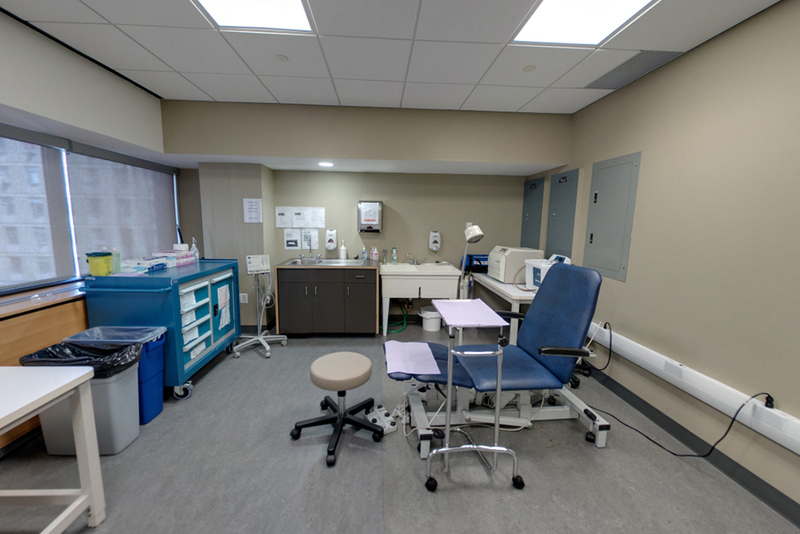 The centre includes simulation suites and debrief rooms, as well as 24 clinical examination rooms typically used for objective structured clinical evaluations (OSCEs). 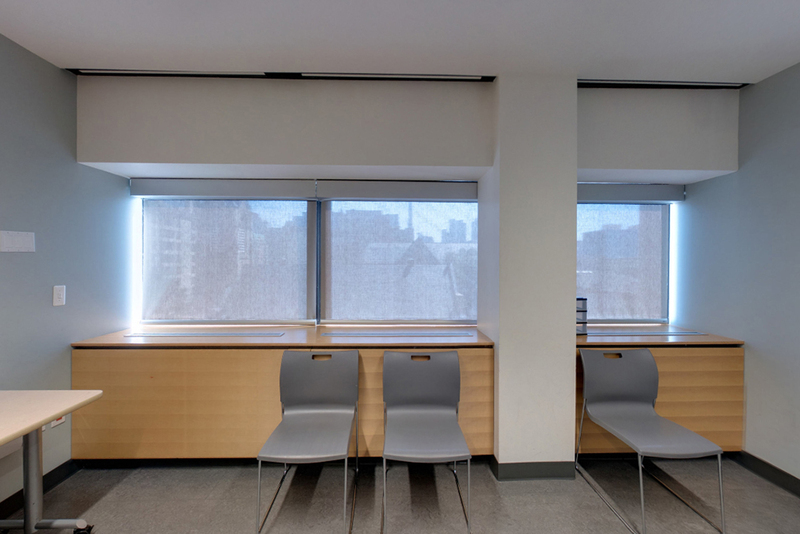 For a glimpse inside the learning centre and to see how the spaces can work for your learning and evaluation requirements, click below to experience our virtual tour. 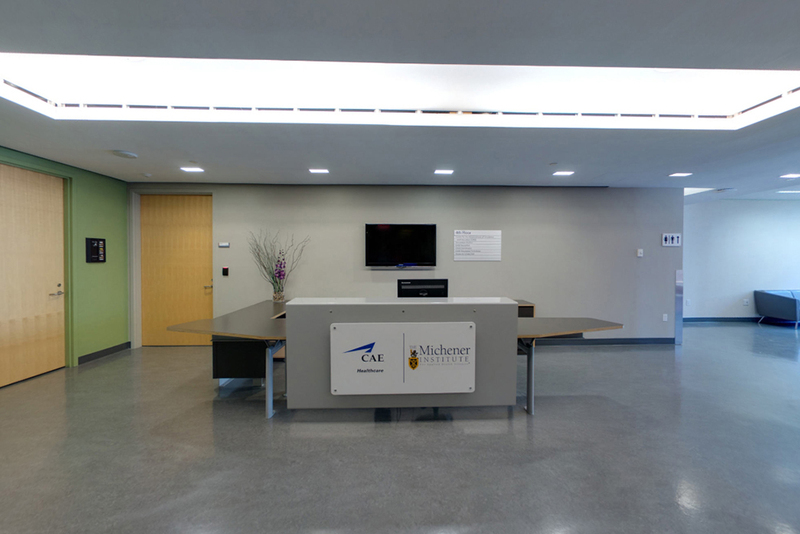 Please contact case@michener.ca if you are interested in booking or if you have any questions about our services. Select the room you would like to visit from the drop down menu at the top of the tour page. Alternatively, click on the floor plan icon in the bottom navigation bar to view a map. Once the map appears on your screen, click on any room in the map that displays a blue pin to view that specific room. 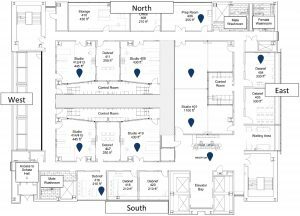 See below to view detailed descriptions of all rooms in the tour. You can also find this information in the bottom navigation bar by clicking on the “i” icon. Click the map to enlarge. Once the map appears, click on any room in the map with a blue pin to view that specific room. 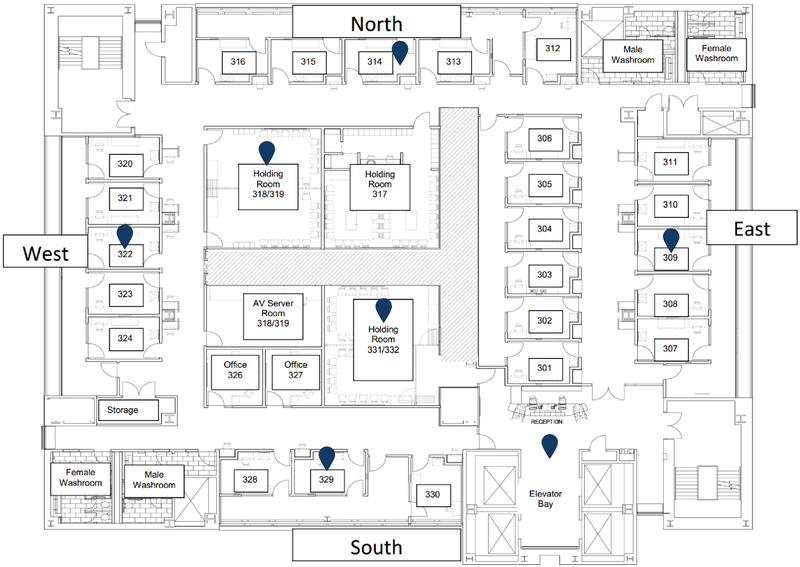 Our virtual tour page starts with 4th floor lobby. 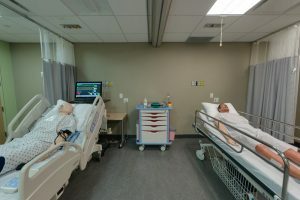 Room 419 is one of our four medium-sized simulation suites. It is set up for a Respiratory Therapy scenario where students learn how to safely manage changes in the airway of a sophisticated manikin (SimMan). 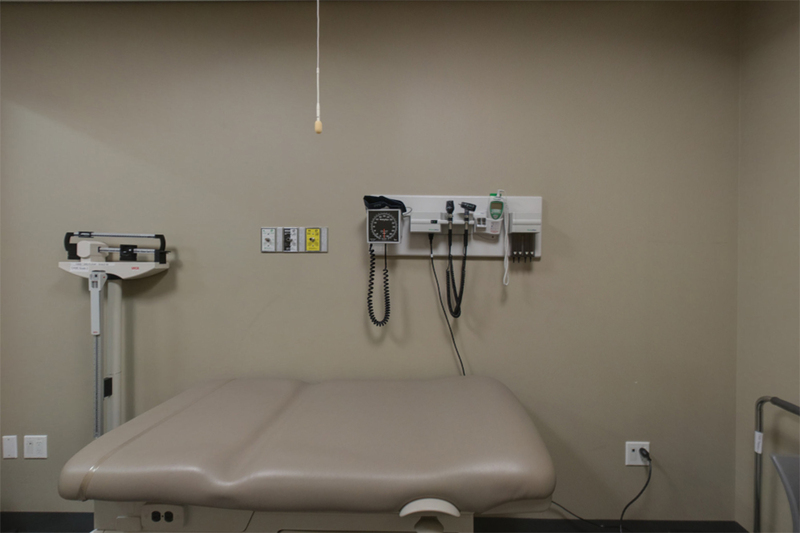 Room 414/415 is one of our four medium-sized simulation suites. 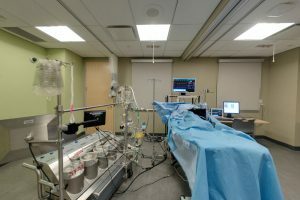 It is set up for a Cardiovascular Perfusion scenario where students learn how to use a heart-lung machine during simulated open heart surgery. 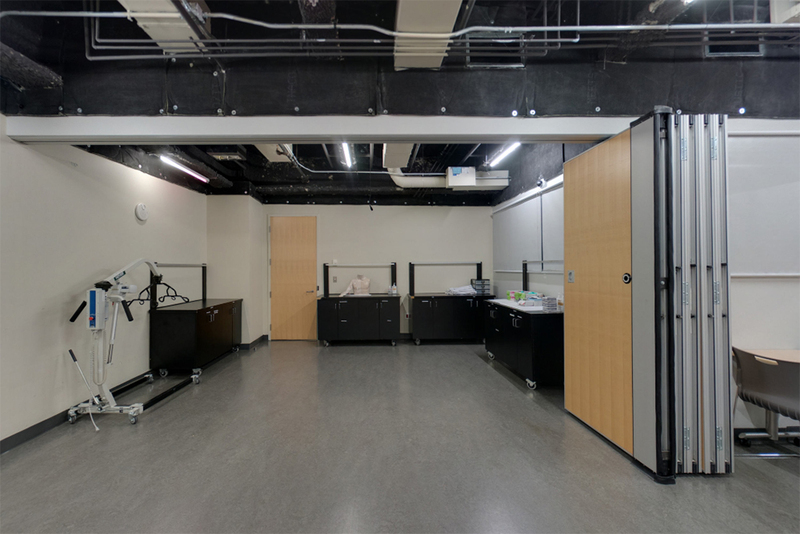 Room 412/413 is one of our four medium-sized simulation suites. 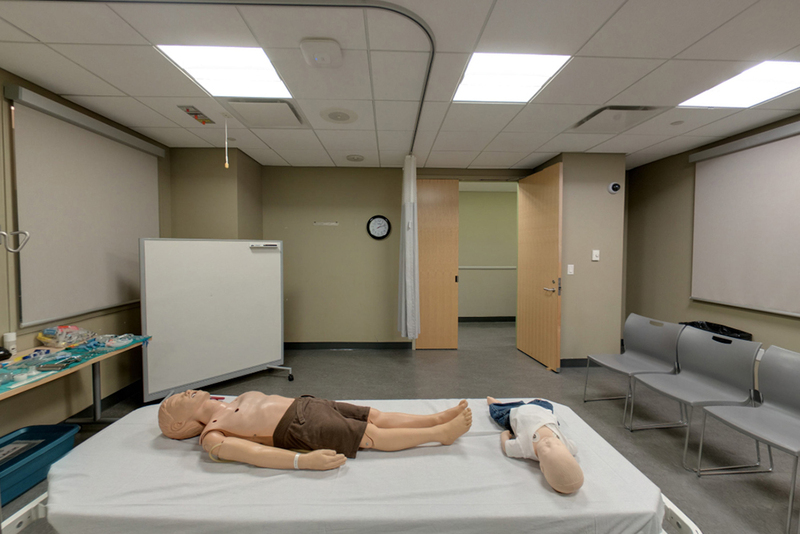 It is set up for a Pediatric Advanced Life Support course offered through our Continuing Education Department. Room 409 is one of our four medium-sized simulation suites. 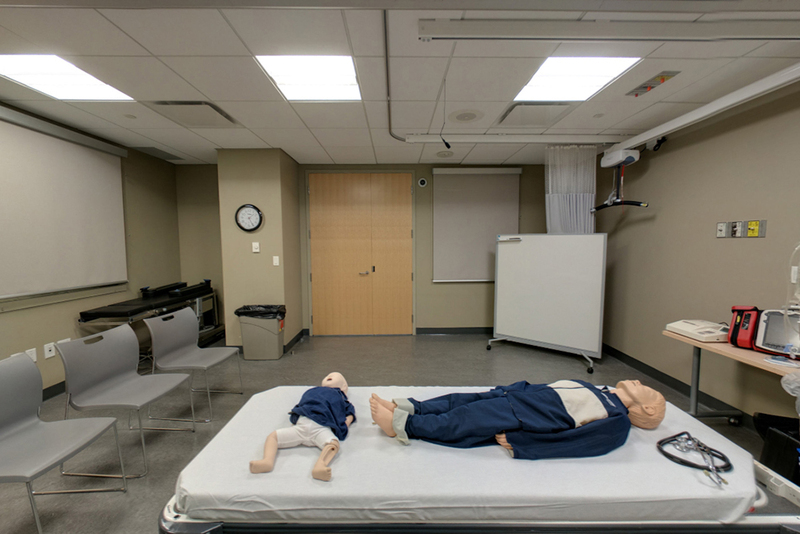 It is set up for a Pediatric Advanced Life Support course offered through our Continuing Education Department. 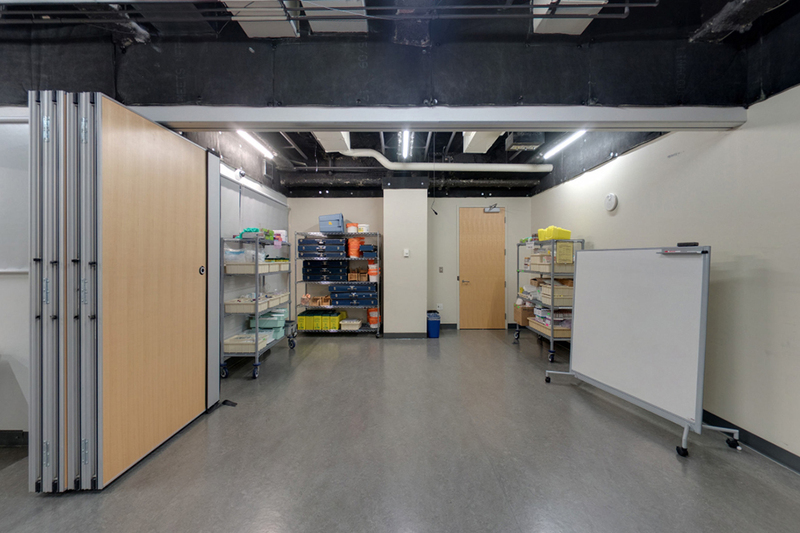 Room 409 also features a ceiling lift for patient transfers. Room 406 is ideal for procedures where functional plumbing is required, including moulage preparation and hand washing education. 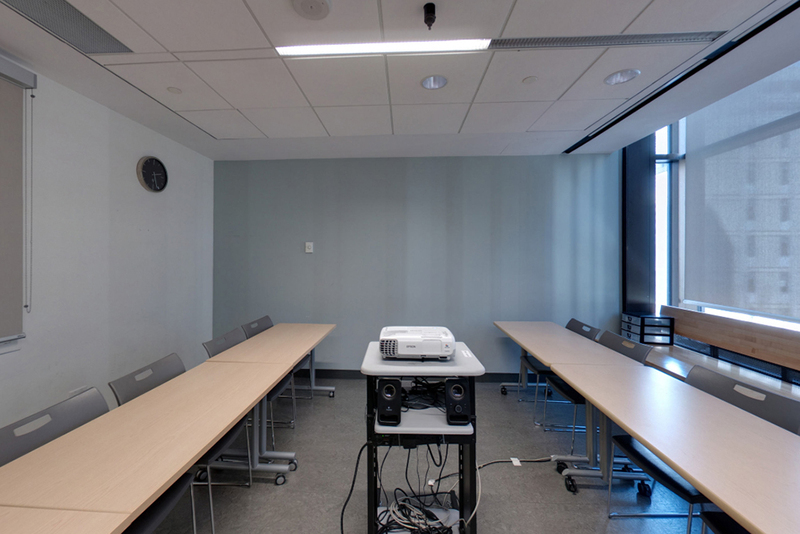 Room 404 is an example of one of our larger debrief rooms on the 4th floor, and can accommodate approximately 20 people. A computer and projector with Internet access are standard features, and can be used to access our web-based video recording and debriefing platform. Debrief Room 404 has the same layout and features as room 403. 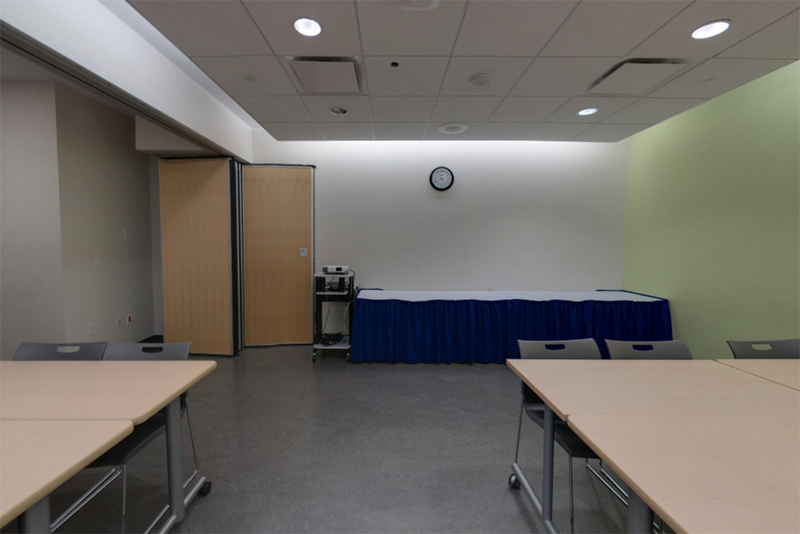 Room 416 is an example of one of our smaller debrief rooms on the 4th floor, and can accommodate approximately 20 people. A computer and projector with Internet access are standard features, and can be used to access our web-based video recording and debriefing platform. Debrief Room 416 has the same layout and features as rooms 418 and 420. 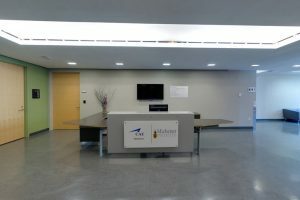 Welcome to the 3rd floor of the Centre for the Advancement of Simualtion and Education (CASE). 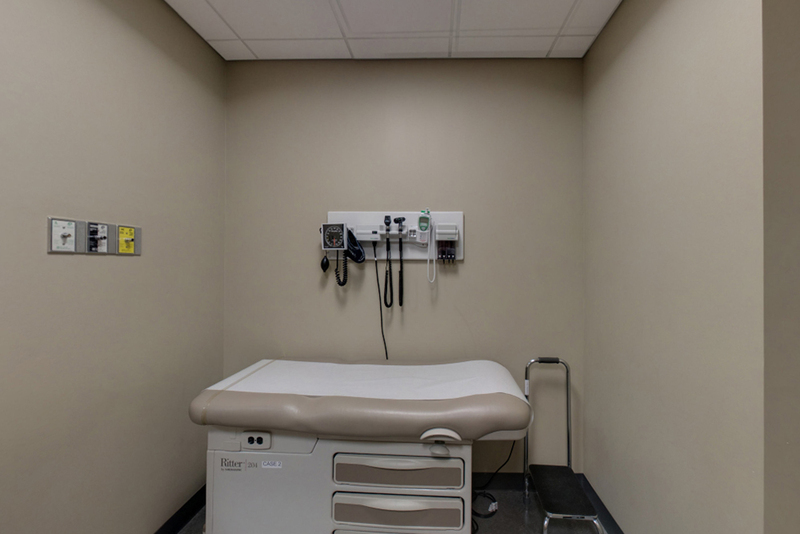 The 3rd floor is focused on assessment, with 24 clinical examination rooms that are frequently used for objective structured clincal evaluations (OSCEs). 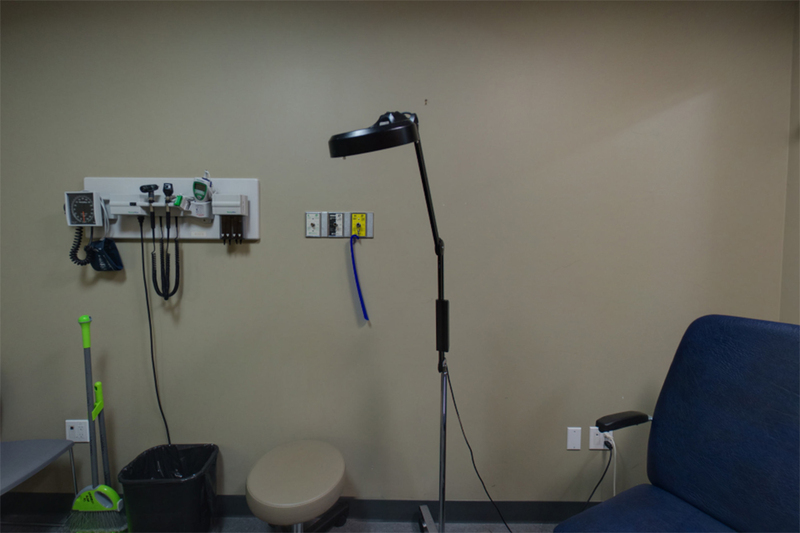 It also houses Michener’s Chiropody Clinic, which supports the Chiropody Program and offers foot care to the public. 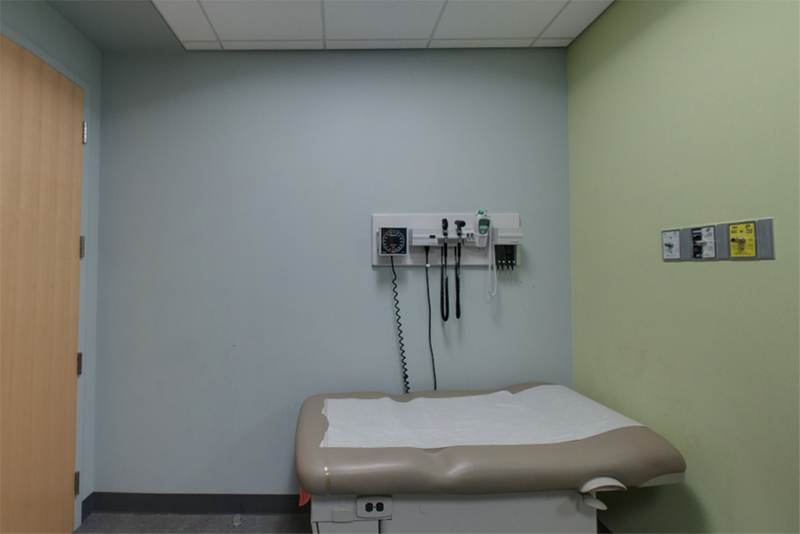 This is a representative layout of one of our clinical examination rooms in the north corridor. We have a total of 24 OSCE suites, all of which are fully integrated with audio/visual equipment for external monitoring and video recording. It is possible to initiate video recording in all 24 OSCEs with the single click of a button, and assessors and learners can remotely view recordings via our web-based platform. Additionally, all OSCEs have integrated overhead announcements that can be pre-recorded or done in real-time. 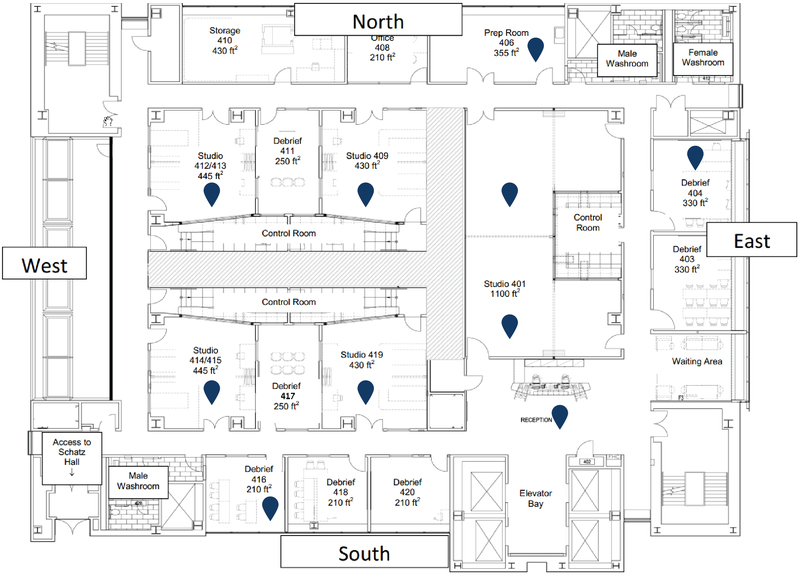 This is a representative layout of one of our clinical examination rooms in the south corridor. We have a total of 24 OSCE suites, all of which are fully integrated with audio/visual equipment for external monitoring and video recording. It is possible to initiate video recording in all 24 OSCEs with the single click of a button, and assessors and learners can remotely view recordings via our web-based platform. Additionally, all OSCEs have integrated overhead announcements that can be pre-recorded or done in real-time. 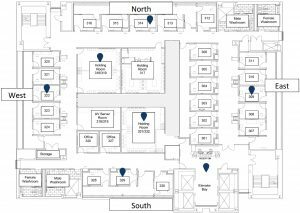 Located just to the left of reception, room 331/332 is an ideal small classroom or holding room for workshops and OSCEs. It can accommodate up to 30 people in classroom style, and comes standard with a computer and projector with Internet access. 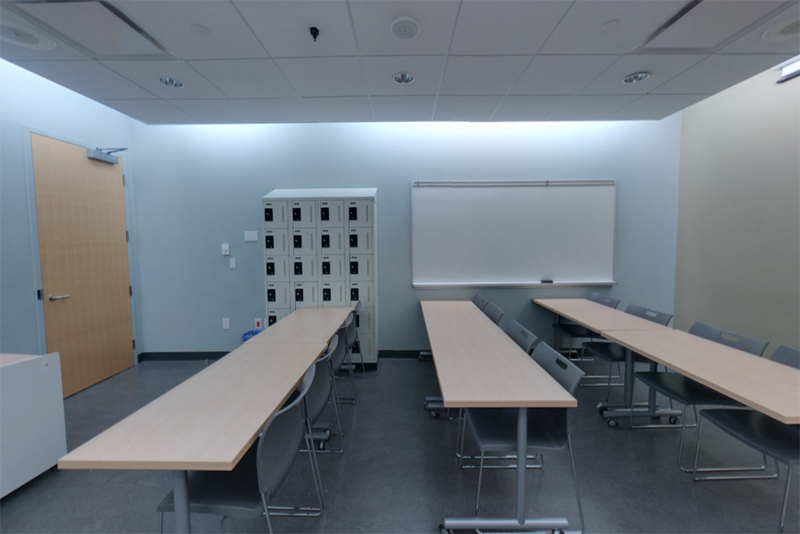 Located in the west corridor, room 318/319 is an ideal small classroom or holding room for workshops and OSCEs. It can accommodate up to 30 people in classroom style, and comes standard with a computer and projector with Internet access.